This page contains pictures and information about Shield Bugs in Tribe Carpocorini and Tribe Agonoscelidini that we found in the Brisbane area, Queensland, Australia. Tribe Carpocorini and Tribe Agonoscelidini are very close related and we put the two tribes in this page. Gordon F. Gross's book (1976) put them together in Caspocris group. 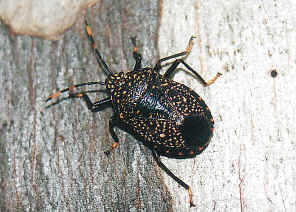 The stink bugs in this group are small to medium size, usually with shiny dark colours. Looking around a gum tree trunk always find some new bugs. 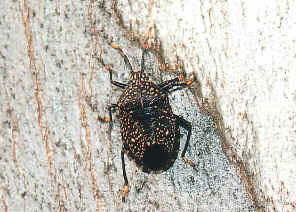 This is another stink bug that we found wandering on a Gum tree trunk. We first saw it in late summer 2003 in Wishart. Its body is thick with many yellow dots on dark brown colour. Please check this page for more information. 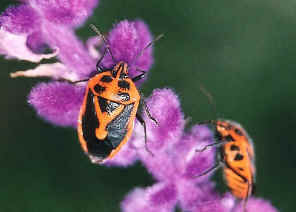 They are called Horehound bugs because they are usually found on the weed horehound. 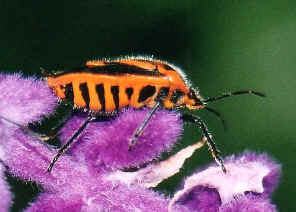 The bug is bright orange, with black marks on the upper and lower surfaces of the body. Click on here for more information. 2. Plant-feeding and Other Bugs (Hemiptera) of South Australia. Heteroptera – Part II - by Gordon F. Gross, South Australian Government Printer, Adelaide, 1976. 3. Checklist for Halyini - Australian Biological Resources Study, Department of the Environment and Heritage, Commonwealth of Australia 2005.